NFL Washington Redskins infant Reebok onesie 6/9 Months FREE SHIPPING! Football season is here! And you sure want to make your family ready for it!!! 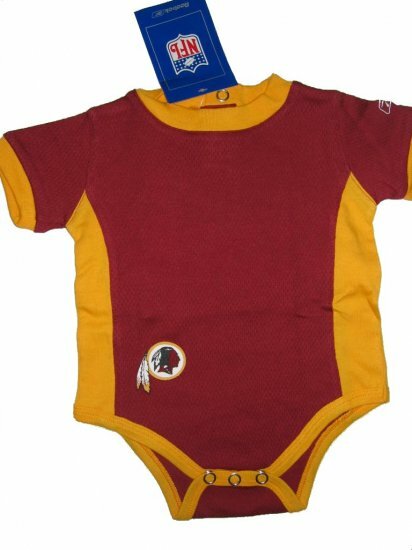 This is an adorable, brand New With Tag Washington Redskins Reebok Onesie. We bought our items from our trusted suppliers. Some of our onesies may not have the NFL tag as shown on the picture, but they have the store tag. They are 100% authentic / officially licensed. We do not sell fake items! This onesie is also great for shower gift! Payment: credit card through Google Checkout, bank transfer (bill pay), money order, or personal check. If you would like to know how to use any of the payment method, please let me know. New NFL Oakland Raiders Infant Onesie Baby size 12M FREE SHIPPING! Kodam V/Brawijaya Indonesia East Java Defense Patch FREE SHIPPING! Indonesia Navy Diver & Unknown Patch FREE SHIPPING! NBA Miami Heat Boy Sweatshirt size 8 S Small FREE SHIPPING!